With the rise of terrorist attacks all over the world and the continuous blaming of Islam, the world is falling back into a stage of ignorance that was supposedly overcome with the development of minds and technology. Because of the brainwashing of many populations and the marginalization of certain cultures and religions, because of the rising terrorist groups founded and funded by the most powerful countries in today’s world, and because of the lack of peace education, it is now unsafe to live in any place on earth. This artwork is entitled “The Tears Of Peace” or “دموع السلام” in Arabic. 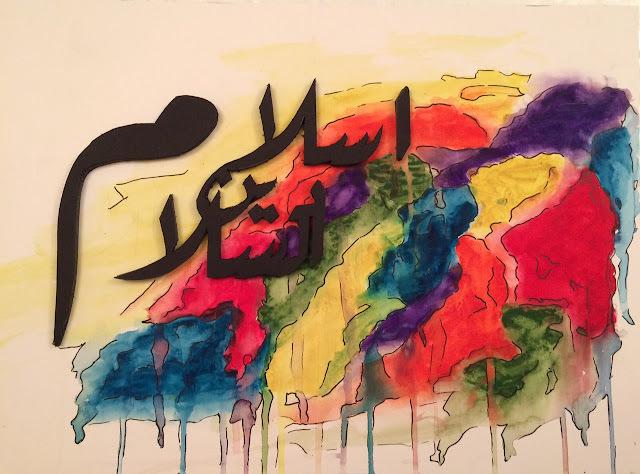 It is an A3 size watercolor painting assorted with the words “Islam religion of peace” cut in Arabic on a black foam board in order to put the expression in the foreground of the piece. Different colors are used in the background of the piece. The first step of the painting was to create areas with each color before incorporating them into on common background with the use of water, an essential element in the construction of the artwork. The effect of leaking watercolors is also done with water, as it helps represent the message that will be later explained. The edges of the colored shapes are enhanced with black pen that also create a sense of 3D to the painting as well as sharpness. 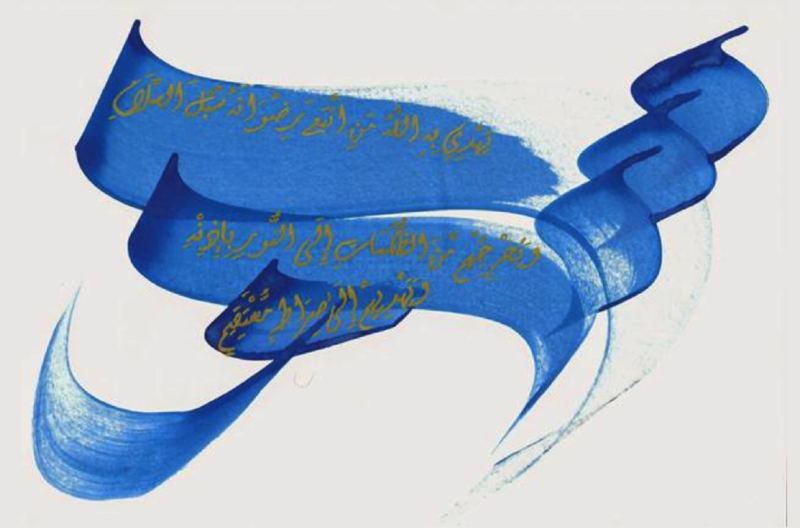 The use of vibrant colors in contrast with the black calligraphy is an element that makes of this artwork a powerful representation of how Islam should be understood. Doing this artwork, I was mainly looking at El Seed’s calligraffiti that incorporates both colors and calligraphy into different solid messages that reach very easily the hearts and minds of the people. El Seed is a very inspirational young artist that was able to let his name shine as a peaceful and meaningful artist in countries that are now victims of various types of terrorism and hatred. Today, a very common stereotype about Islam is about it being a religion that promotes violence, terrorism and war. A stereotype that has been shoved into people’s minds through repetition in media, misconceptions about religious meanings, and alteration of what the holy book of Quran states. Many are being misled, and victims of a propaganda that is enforced by the lack of education and knowledge. Unfortunately, although many non-Muslims understand the message of God in the Quran and associate it with their own religion, others are marginalizing the Islamic communities and labeling them as terrorists. In fact, a solid and recent example is the Paris attack that lead to 130 lives being lost and many damages, whether locally or internationally. France has been the welcoming crib for many refugees of war whether during the Algerian Revolution, the Spanish war, or recently the Syrian Crisis. However, with the birth of many so called Islamic extremists such as ISIS, many of the refugees are being stigmatized as the reason and actors in the destruction of the economy of the country. Hence, “The Tears of Peace” is a representation of what the real Islam is about, a religion of peace, of joy, and comfort. As a first impression, the painting might look like a juxtaposition of colors, merged together in a very random way. However, the main idea behind that is to show in an abstract way the merging of the different continents together in solidarity, each country having their own identity (color). When the painting is converted into a black and white picture, what people would see are mainly dark smudges that are leaking, associated with stains of blood related to what people see in Islam as a violent religion. Looking at the picture in black and white is in a way a metaphor of the cage in which some people are trapped, in which they only see the bad and evil side of what is around them as diversity. However, the original painting is vibrant in colors and shows the right way of perceiving Islam, as a religion that is not close-minded and repressive. The leaking colors represent the joyful tears people should express when our whole world would be as one, when as John Lennon sings, “Imagine there’s no countries” in his song Imagine. The main idea of having the sentence “Islam religion of peace” or “إسلام دين السلام” in Arabic calligraphy is to emphasize on its meaning by having it more towards the foreground of the artwork. The letter “mim” is bigger than the other letters because of its common identity in both the words Islam and Salam, as well as its meaning and value in the Quran as being part of the Muqatta'at, unique letter combinations that appear in the beginning of 29 suras. 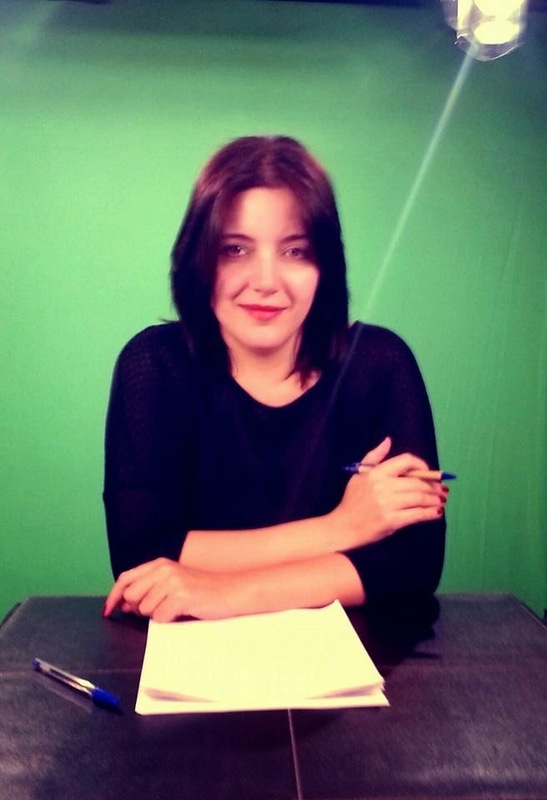 My name is Lea Halabi. I’m currently an architecture student at the American University In Dubai, and was raised in one of the most humble Islamic countries in the world, the United Arab Emirates. I have always been part of a divers environment, starting from a French education background, continuing in an American university, and surrounded by people from different cultures and beliefs. I believe that today’s world is not moving forward; it is declining because of the neglect of humanity and personal rights through the hegemony of inequality and stereotypes. I still believe in the presence of forgiveness in people, but also believe in their cruelty and brutality.